well i bought my chow chow for my girlfriend and now im so attached to the chow chow ( Tibbers) so i've been wondering is it advicable to me to buy a female chow chow and breed?? well here in belgium its hard to rescue a chow chow i mean there are no chow chow on any refugee so my last choice is to buy again :-s I just dont know.. im really addicted to my chow i want him to have a playing mate coz i feel like he is lonely :-s and im working 30 hours a week and i have time to take him out brush him everyday stop going to party coz of my tibbers... i feel like i just want more :-s any advice? I am addicted to my little girl Chestnut as well. But they are high maintenance dogs. Do not think of breeding him until he is two years old at least. 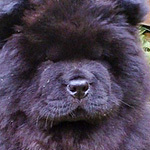 That is advisable for female chows especially to make sure their organs and immune system are fully matured. I decided to have my girl spayed instead. If you breed your boy what would happen to the rest of the litter? Vet bills will make you crazy as they are very prone to skin disorders, allergies, eye problems and luxated patellas . Give him another year before you decide to buy a new one. Breeding rescue chows is never advisable but getting another chow for company is different. You should ask yourself who will look after an eight week old baby if you dont go for a rescue. They need to go outside at least once every four hours and need four feeds a day when that young. It is a lot of work and also a lot of fun. Only you can tell if you can afford and commit to the amount of care two dogs bring for up to 15 years. Breeding should only be undertaken when you have the pedigrees of both chows with their health history otherwise you are just setting up more cute baby chows who may turn out to have health problems and possibly be abandoned by their new owners to rescues. I know this is worst case scenario but I strongly believe there should be no other reason to breed chows than to try and improve the breed....fitness, health, confirmation and character. There are many health checks you should do on both parents before considering breeding. Hips and Elbows should be tested and eyes at the very least. As Constantina has said the vet bills can also be very high and if you have not chosen pedigrees and types carefully they could prove difficult to home. Sorry if I sound very negative but I spent two years finding the right puppy and then a further two years to find the right mate when I had my litter. (Black chow below is cream girls mom) I had all the tests done and spent hours pouring over pedigrees and types looking for the right match.